We're sure you're curious—yes, cell phone and owner were "reunited"! In a previous post, Julie asked, "I've been reading your blog for about four years, and no one has "gone downstairs" yet. What is the normal length of the novitiate period?" Well, Julie, first we had to stop and think. Has it really been four years since we started this blog? It's rather amazing that we are still at it! Your question gives us the opportunity to address a question others have asked in messages: to tell you a little bit more about the novitiate. One reader opined that some people have the idea that once a woman enters that is it and are surprised if a postulant or novice leaves. First, Novitiate is both a place in the monastery and a period of formation! Generally, we put postulants, novices and simple professed under the umbrella of "the novitiate." 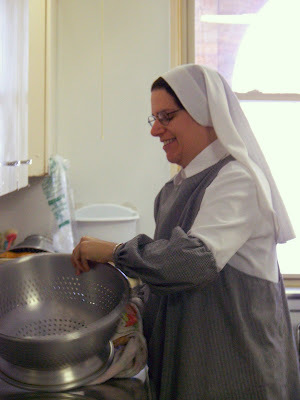 However, once a sister makes profession she usually says, "I'm professed by I'm still in the novitiate." But in referring to the Sisters in formation we will say, "The novitiate sisters or the novices" without distinguishing the different stages. Flash from the past! 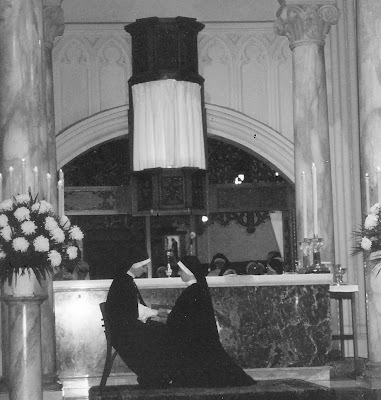 Sr. Diana Marie as a postulant! In our monastery postulancy is from about 9 months to one year. A year is absolutely the longest it can be while 6 months is the shortest. I can assure you every postulant thinks that it should be only 6 months...or less! A very serious new novice! Novitiate can be as short as 1 year but is 2 years and First Profession is 3 years but can be renewed year by year for another 3 years. For the first 2 years of profession the sister remains in the novitiate. Her third year is called the Year of Integration when she moves over to the professed dormitory and begins to have more responsibilities in the monastery like "turn duty", a regular work assignment, etc. When we began MonialesOP we didn't have anyone in the novitiate and had not had anyone for a few years. Then we had 2 postulants but one left and the other became Sr. Diana Marie who is preparing to make First Profession on February 2nd. Sr. Mary Amata came to us last year as a transfer from another contemplative community and by our constitutions had to make a canonical novitiate. God willing, in April she will move over to the professed and take on more specific duties. She is still in perpetual vows so it will be 3 years before she makes Solemn Profession. In fact, provided she and Sr. Diana Marie persevere they will be making Solemn Profession within a few months of each other! In recent times we mostly refer to the novitiate as "formation" and it is that, but it is also a time of testing. Both the sister and the community tests whether a woman truly has a vocation to our way of life. How is that done? In the old days there were all sorts of stories, such as a novice being told to plant a dead stick to see if she possess the virtue of obedience. Frankly, who has time for things like that? And in the Dominican understanding of obedience to do so without questioning (respectfully, of course) would show a certain lack of prudence and common sense. For Dominicans obedience requires the use of our intelligence! No matter how sure (or unsure!) a woman feels her vocation to the contemplative life is, it is in actually living the day-to-day life that the validity of this God call is confirmed. Is she growing in the life of virtue? Is she flourishing as a human person or becoming more closed in on herself? Is she truly seeking God? Is she allowing God to more and more to be the center and purpose of her life? Is she growing more deeply in an intimate relationship with God? Is she growing in mind and heart in the Dominican spirit and into the community? Sometimes over time a sister realizes that she is not called to this way of life and so she leaves. There is nothing wrong with this at all and in fact we always say it's good she leaves now while in the novitiate before she has made the commitment of profession. A religious vocation is an invitation of love from God and as such it "demands" a free response. This is why, like every other vocation our yes must be given daily! So, the next time you read or hear about a man or woman entering religious life remember that this is just the first step. Continue to pray for them that they will receive the grace of perseverance....or the grace to know and accept that God is calling them to another way of life. If we use marriage as the analogy, postulancy is the first dates, novitiate is going steady, First Profession might be considered an engagement (but not our modern understanding but the ancient and medieval understanding), and Solemn Profession is the marriage. November 16, 1996—Sr. Mary Catharine makes Solemn Profession in the hands of Sr. Mary Martin. Jersey Winter And Mushroom Soup!